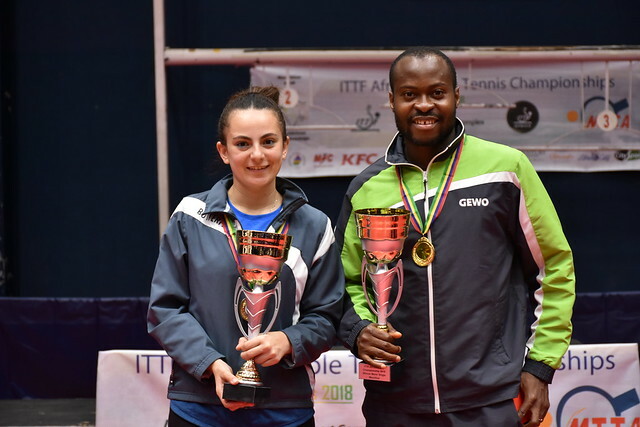 Resounding performances, Egypt and Nigeria, the respective top two seeds, booked their places in the final of the Women’s Team event at the 2018 African Championships, following success in Port Louis, Mauritius on Tuesday 4th September. Neither outfit was at any stage seriously challenged; three matches to nil victories being the order of proceedings in the group phase as well as in the penultimate round. Represented by Farah Abdel-Aziz, Yousra Helmy and Dina Meshref, Egypt concluded their initial phase engagements by overcoming Angola’s Isabel Albino, Jerusa Borges and Ruth Tavares to conclude the group in first place ahead of South Africa. In a hard fought full distance five match contest South Africa, with Simeen Mookrey, Mthabiseng Mtshoelibe and Danisha Patel on duty, had sealed runners up spot by overcoming the Mauritius trio comprising Elodie Ho Wan Kau, Oumehani Hosenally and Nandeshwaree Jalim; the mainstay of the victory being Danisha Patel. She beat both Elodie Ho Wan Kau (11-9, 11-8, 11-7) and Nandeshwaree Jalim (8-11, 11-8, 11-7, 9-11, 11-7).The wins set the scene for Simeen Mookrey to be the heroine. She duly accounted for Elodie Ho Wan Kau (11-4, 11-9, 11-4) to seal the victory. Meanwhile, in the counterpart group; in the vital contest between the hitherto unbeaten teams, Nigeria represented by Olufunke Oshonaike, Offiong Edem and Ajoke Ojumu secured a three-nil against Algeria’s Katia Kessaci, Sannah Lagsir and Lynda Loghraibi to reserve first place. Semi-finalists decided, first and second in each group progressing; the outcomes continued to be as resounding as in the initial phase. No changes to the earlier selections, Egypt proved too strong for Algeria, as did Nigeria with Offiong Edem, Janet Effiom and Olufunke Oshonaike on duty when facing South Africa’s Simeen Mookrey, Mthabiseng Mtshoelibe and Danisha Patel. The final is set for 5.00 pm (local time) on Wednesday 5th September and follows the commencement of the Mixed Doubles event, in addition to the fixtures to determine places three to six in the Women’s Team competition.